Calculate Cost - Tree Stump Removal & Tree Stump Grinding -Tree Service. Fast & Affordable Stump Removal, Utah. Calculating the cost of grinding a stump is fairly easy. A little measuring and some simple calculating and your done. If a stump needs to be cut off there may be a small charge to finish cutting to ground. We can usually cut for free in most cases though. There could be an additional charge for large roots. We offer veteran, first responders and senior citizen discounts. We have a $110.00 minimum charge. Additional charges may apply for stump grinding north of Layton and south of Lehi. 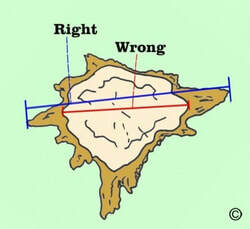 Below are some diagrams of how to measure. If you are still having a difficult time figuring a price on your own we will go to the site and give you an estimate. The cost of hauling mulch is $2.00 to $3.00 per inch of the stump measurement. There could be an additional charge if a lot of roots were ground out during the stump grinding process. After grinding the stump we will give you a firm price to haul the mulch.